Click here for a Kansas county map showing locations of KATP sites. Click on thumbnail of photo for a larger view. The Bell Site is a Wilmore complex site occupied during the Middle Ceramic period (ca. A.D. 1000-1500). During this KATP event 2,021 hours of labor were donated by 47 KAA members. This is a Little River focus Great Bend aspect habitation site. Eighty-two KAA volunteers donated 2,799 hours toward the study of this Protohistoric period (ca. A.D. 1541-1800) site. Artifacts were processed at the 1999 KATP. The Le Beau Site was an Upper Republican phase (Central Plains tradition) earthlodge site occupied during the Middle Ceramic period (ca. A.D. 1000 - 1500). During the 1982 KATP, 89 KAA members volunteered approximately 3,827 hours of labor. 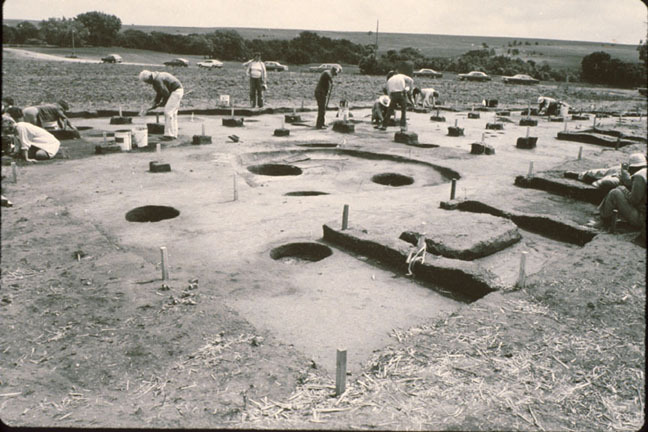 Reported in: Don Rowlison (1982) "Plans for the KAA Annual Dig" Journal of the KAA 3(4): 51-62; Don Rowlison (1982) "KAA Dig in Northwest Kansas a Success," Kansas Preservation 4(6):1-2; William Brogan and John Reynolds (1982) "Kansas Archeology Training Program: Experimental Archeology, Replication of a Grass Lodge Pithouse" Journal of the KAA 4(1-3):18-32; Don Rowlison (1983) "The Le Beau Site, 14NT301: A Preliminary Report of the Eighth Annual Kansas Archeology Training Program" Journal of the KAA 4(1-3):2-12; Mary Conrad (2014) "Why Ashes in Pits?" KAA Newsletter 26(2-3): 19. 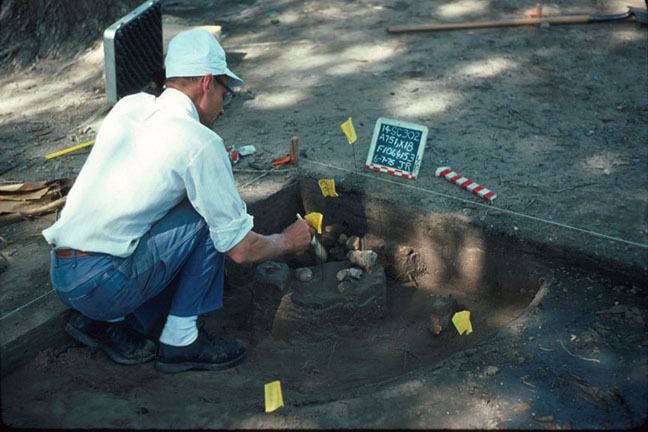 The Kermit Hayes Site was a small protohistoric (ca. A.D. 1541-1800) habitation site occupied by members of the Little River focus of the Great Bend aspect. Sixty KAA members volunteered 2,600 hours of labor in the study of this site. Reported in: Don Rowlison (1981) "Plans for the KAA Annual Dig" Journal of the KAA 2(2): 67-7; Don Rowlison (1981) "K.A.A. 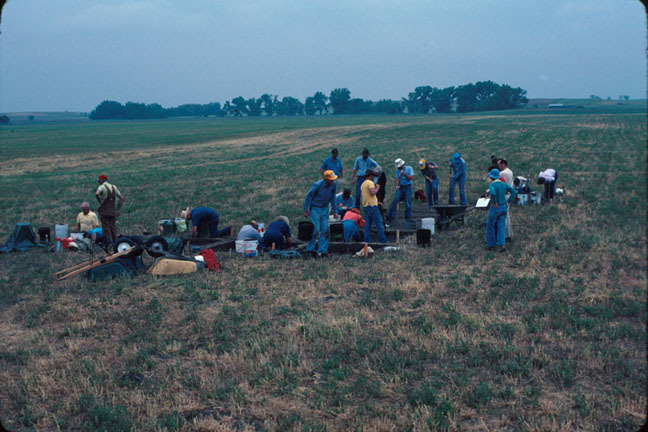 Dig and Kansas Archeology Training Program Uncovers Pithouses Near Lyons" Journal of the KAA 1(5 & 6):118-120; Don Rowlison (1981) "KAA Dig Uncovers Pithouses Near Lyons" Kansas Preservation 3(6):1-2; William Brogan and John Reynolds (1982) "Kansas Archeology Training Program: Experimental Archeology, Replication of a Grass Lodge Pithouse" Journal of the KAA 4(1-3):18-32. 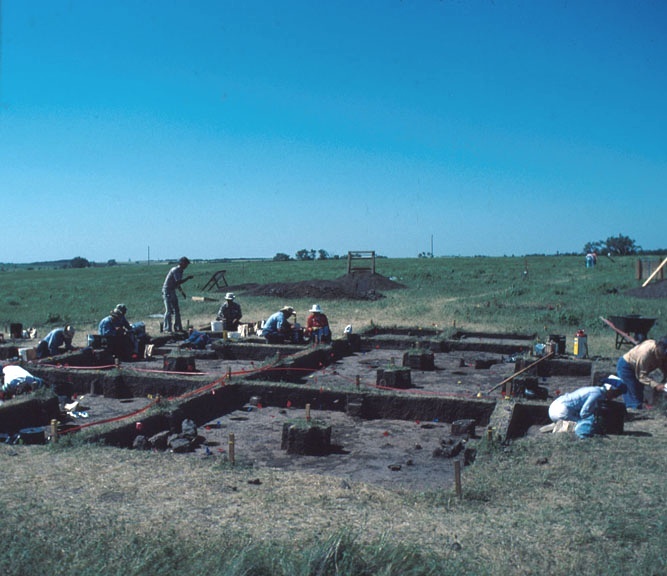 Forty-seven KAA volunteers donated 2,900 hours of labor during the KATP event which exposed the remains of an earthlodge occupied by an Upper Republican group (Central Plains tradition) during the Middle Ceramic period (ca. A.D. 1000-1500). Sixty KAA volunteers provided approximately 3,000 hours of labor on these two prehistoric sites during this KATP event. Both sites were habitation areas occupied by members of the Pomona focus during the Middle Ceramic period (ca. A.D. 1000-1500). Reported in: Thomas Witty (1979) "Plans for the 1979 KAA Dig" KAA Newsletter 24(6): 1-7; Randall M. Thies (1981) Archeological Investigations at John Redmond Reservoir, East Central Kansas, 1979 Report on file, Archeology Office, Kansas State Historical Society. During the second KATP at the Tobias Site, 73 KAA members volunteered a total of 3,710 hours of labor. Reported in: Thomas Witty (1978) "Plans for the 1978 KAA Dig" KAA Newsletter 23(7): 1-7. The Tobias Site is a protohistoric village site identified as belonging to the Little River focus of the Great Bend aspect. It was inhabited by the people who the Spanish explorer Coronado referred to as "Quivirans" during his 1541 visit to the region. They are believed to be ancestors of the modern-day Wichita Indians. This site is owned by the Kansas State Historical Society. It is one of nine archeological sites in the Little River Archeological District on the National Register of Historic Places. The Tobias Site and the nearby C.F. Thompson site are listed as National Historic Landmarks under the name Tobias-Thompson Archeological Complex. Fifty KAA members volunteered 3,500 hours during the 1977 KATP. Eighty KAA members volunteered approximately 3,440 hours of labor during this year's KATP event at El Cuartelejo. During the 1975 KATP 90 KAA volunteers contributed 1,948 hours to enhance our understanding of these two important archeological sites. The cultural affiliation of the Timber Canyon Site remains unknown, but the site is listed as a component of a National Historic Landmark District. El Cuartelejo is the northernmost pueblo in the United States and the only Puebloan site in Kansas. It was occupied by Puebloans who fled Spanish oppression in the Southwest during the early Historic period, ca. A.D. 1680. The site is listed as a National Historic Landmark. Located in Lake Scott State Park, interpretation at this open-air site consists of etched-metal markers placed around the restored foundation. There are no associated museum facilities.